The Project Production Institute (PPI) is pleased to release Volume 3 of our Technical Journal. 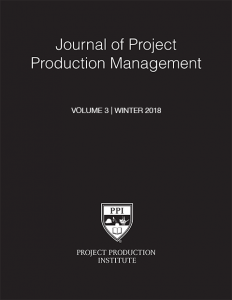 The Journal establishes the technical body of knowledge comprising Project Production Management and Operations Science, drawing on the knowledge and research of leading academics, industry practitioners and other experts in those fields. An additional feature of the Journal is the Project Production Management Glossary of terms, 2019 Lookahead and events calendar. Members can sign in and read the full journal now. We have limited printed journals for our members if you would prefer a printed version please request one below.